Cervical nerve impingement describes the crowding and possible compression of a neurological root in the neck. The cervical spine has 8 sets of nerve roots that exit from the vertebral column bilaterally. Any of these nerves can become impinged upon by many possible structural causes, possibly eliciting pain, tingling, numbness, weakness and various forms of neurological dysfunction. Impingement is a diagnosis that is often very confusing, since it is used synonymously with other diagnostic terms, such as compression, effacement, mass effect, displacement or impression by some care providers, but is also commonly used by other doctors to represent a specific diagnostic conclusion that differs from some or all of the above verdicts. This patient guide attempts to clarify and simplify one of the more common diagnostic conclusions used to explain countless neck pain syndromes: nerve impingement. We will provide guidance for patients on understanding what the terminology means and also recommend guidelines for physician in the proper use of this diagnostic term in relation to other similar nomenclature. Impingement means to crowd or make a physical impression on something. Therefore, nerve impingement in the neck is a diagnostic term that describes an event when some structure crowds or touches a cervical spinal nerve root. There are many possible tissues that might impinge on a cervical root. Additionally, the causes of this impingement can range from normal spinal aging to atypical and excessive spinal degeneration and from spinal injury to the collateral effects of spinal surgery. We would be remiss in not mentioning that neurological impingement is extremely common and is virtually universal to some degree as patients get older. The cervical nerve roots branch off the spinal cord within the central vertebral canal. They travel through the area on the side of the spinal canal, called the lateral recess, heading for the neuroforaminal openings. These are simply holes through which the nerve roots exit from the cervical spinal anatomy in order to develop the network of neurological tissues that serve specific areas of the anatomy. Virtually the entire body is innervated by nerve root tissues. These nerve roots facilitate signal transmission between the various locations of the anatomy and the brain. The three message types that are transmitted include motor impulses to the muscles, sensory information to the brain and autonomic messages that are influential in many bodily systems. When impingement occurs on nerve fibers, there is the chance that the nerve may be impeded in its ability to function correctly. However, by definition, impingement does not imply that any negative effects have occurred or that they will occur in the future. Let’s move ahead into the next section and compare the diagnostic term of impingement versus the diagnostic term of compression. On the less serious end of the diagnostic spectrum, impingement can mean that there is little excess space around the nerve and that it may be in danger of suffering some form of contact if the space is reduced any further. This is called crowding of the nerve. A more serious meaning of impingement includes the possibility that the nerve has been contacted by some tissue, but does not demonstrate any irregular signal or positioning. The terms used can include nerve effacement or nerve contact. Moving further upwards on the level of clinical severity and symptomatic potential, the term impingement can mean that the nerve has been displaced. This simply means that some force exerted against the nerve has caused it to shift to some degree from its typical position. Finally, the most significant diagnostic application of the word impingement can be used to describe a mass effect on the nerve, in which case the neurological tissue might be compressed on one or more faces due to force exerted against it. This diagnosis is where confusion begins, since the use of impingement here is so similar to the diagnostic term compression. 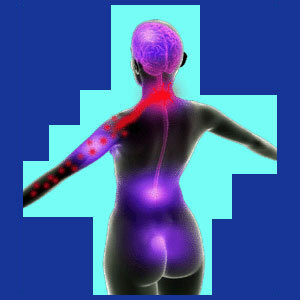 However, impingement does not necessarily imply that the nerve is acting differently or signaling improperly. Meanwhile, compression does imply a certain degree of dysfunction in the nerves ability to signal properly. Compression is a different diagnostic term and is used when the nerve is obviously compromised by physical force that is exerted against it, changing its shape and functionality, as well as potentially damaging it temporarily or even permanently. Usually, the diagnostic term compression is reserved for circumstances when the nerve is obviously trapped in a structural “between a rock and a hard-place” scenario where it can not move to prevent from being compressed or suffering signaling loss. Patients must question their diagnosticians in order to understand the exact meaning of any diagnostic terminology applied to them. When it comes to diagnostic nomenclature involved in nerve impingement and compression syndromes in the neck, this is vitally important in order to decide on the best course of treatment, and more importantly, decide whether treatment is even necessary at all. To our professional readership of doctors and chiropractors, we suggest reserving the use of the word impingement for non-compression scenarios where the nerve space is reduced, where some structure might be contacting or displacing the nerve, but not when a structure is imparting mass effect onto the nerve itself or any definitive type of compression. This suggestion is similar to the clarification of various uses of the diagnostic terms spinal and foraminal stenosis, since these terms are also very ambiguous, subjective and open to interpretation. For examples where diagnostic evidence and clinical symptomatic correlation suggest a compressive neuropathy is present, the term nerve compression or “pinched nerve” serve the patient much better than impingement. For more information on clarification of impingement versus compressive neuropathy, please also read our essay examining cervical nerve root compression.